Italy wing Alberto Sgarbi made his international debut against England during the 2008 Six Nations, and went on to make his first start against Wales while Kaine Robertson was out injured. Sgarbi, who plays his club rugby for Benetton Treviso, had previously represented the Azzurri at U18, U19 and U21 level. He was a part of the Italy U21 side that registered two wins during the 2007 Six Nations. 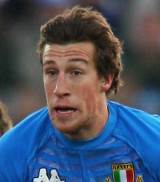 Sgarbi - who remained part of Treviso's squad for the inauguaral season in the Celtic League - lined up for the national side four times during the 2011 Six Nations and was partnered in the centres by Clermont's Gonzalo Canale. Sgarbi will hope to develop this partnership in the forthcoming World Cup having been named in Nick Mallett's 30-man squad.